Live by your budget, save money, pay off additional debt...all simultaneously! *Includes a printable WORKSHEET to make creating your budget easier than ever... and I show you an 'example' so you can SEE exactly how it WORKS! "For a very long time, I've aspired to follow Dave Ramsey's 7 Baby Steps. I never seemed to get past step one and I couldn't understand why. Your Financial Freedom Guide allowed me to see why. I knew "what" to do but obviously, I didn't know "how." Your guide explains the "how!" Thank you for sharing your experience and your wisdom with others! God bless you!" "I've been using your Financial Freedom Guide for only a few months and have already payed off my car. Thank you, this WORKS." You may look at HappyWifeStyle.com at first glance and think that maybe I've always been this happy and maybe assume that I came from a privileged lifestyle. Actually, this is not the case. I didn't come from money and everything I have today I have because I had the desire to create this life for myself. I have always been unsettled by mediocrity and have strived to make my life better. I didn't have anyone teach me about money as a child or young adult. The tools I know about and use today I learned from those smarter than me. My husband and I have had a life coach for the past decade and I've soaked up a ton of valuable information that has helped our life be what it is today. One thing I am is a good student. If I learn about a topic, I read about it and study it....but most importantly, I implement it. I'd like to share what I've learned with you....because I wish I knew about this when I was younger. She's 30 years old and her life is nothing like she imagined it would be at 30. She lives on her own, in a very tiny house. She's walking out the door to go to a job that isn't her passion...she had been in tears the night before because she didn't have quite enough money to pay all of her bills. As she walked to her car that she is embarrassed by, she stops short because her hubcaps had been stollen. She almost laughs and thinks to herself, "This is not my life! Something's got to give." I imagine watching this girl from down the block, she doesn't know I'm there. I walk up to her and give her a box with a bow around it. I say "Here's some tools that will help you change your life." ...and walk away. She's the girl I had in mind when I developed this Financial Freedom Guide. That girl was me. I tell you that story because I'm very passionate about helping you because I WISH I had someone share this information with me even sooner in my life, so I cannot keep it to myself. It worked for me and I believe it can work for you. Do you have a budget? Does your spouse have a budget? Are you in debt? Do you make enough money to be comfortable and feel financially free? Do you have money saved for your future? Do you feel like you don't have enough money leftover after paying your bills to save anything? Do you have a detailed plan to pay off debt? If an emergency happened, do you have a plan? Do you know what year you will be totally debt free with the way you spend now? Do you worry when it comes to money? Does money make you feel empowered? Do you know EXACTLY where you are in your financial situation...or does your spouse take care of that? You need to know. I ask these questions to get you thinking about this because it's SO IMPORTANT to make a change if you don't have your financial life in order! I hope you take advantage of this valuable information. Like I said, I sure wish I would've known about it sooner. "What's the best time to plant a tree? Twenty years ago. What's the next best time? Right now. I want to hear from you! Feel free to email me your testomonial of what this Guide has done for you and your family to shannon@happywifestyle.com. I'm hearing so many testomonials from you guys... you're implementing your budget, you're saving more than ever, and you're kicking your debt's A$$!! UPON PURCHASE: THIS IS A DIGITAL DOWNLOAD. Download the eBook and Worksheet links right away because the links do expire after one week. If this happens, contact me and I will reactivate the links, but to avoid this, download to your device immediately to ensure you have it saved and can refer to it for a lifetime. I recommend printing it out along with an extra copy of the worksheet so you have a master copy for future. You'll find that over time, you may need to make adjustments to your budget as your life changes, and this will make it easy! Yes, you'll want to teach this to your children, share it with your friends, family and loved ones. 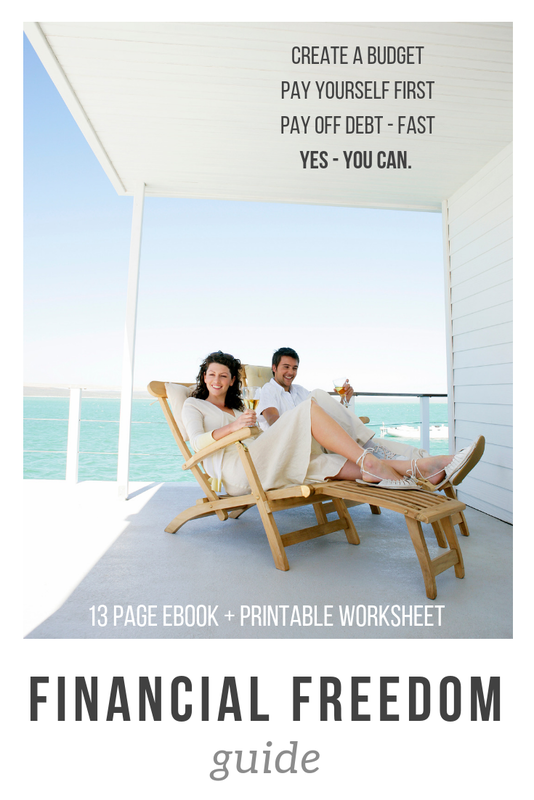 Disclaimer: This Financial Freedom Guide is Copyright of Happy WifeStyle 2015. It is not to be copied, distributed or sold once purchased, unless you are an affiliate and use appropriate affiliate links. Happy WifeStyle intends this Guide to be a valuable educational tool to learn to manage finances in a more efficient and beneficial way. Happy WifeStyle does not take responsibility for the buyer's financial situation and cannot guarantee results for this reason. It is the responsibility of the buyer of this Guide to implement the information given in order to get the desired results.